What have you done to make your team better today? Woodside Hoodies are here! The following people (see lists below) get their hoodie for free for attending practice regularly, if you didn't attend enough practices to earn your hoodie you can purchase one for $25. We also have some extra hoodies for parents, siblings, or anyone else that might want one. 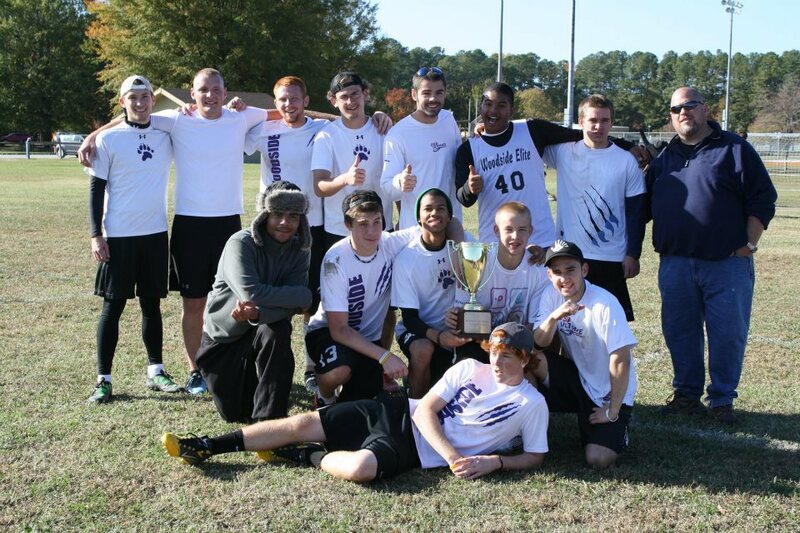 The hoodies will be at practice again this Monday Dec. 5, 2011 and at the indoor tournament to wrap up the fall on Sunday Dec. 11, 2011. So show up and get your hoodie. We will be having a fun little indoor tournament to wrap up the fall season on Sunday December 11, 2011. All teams, Varsity, JV, and Girls are welcome, it will be a great chance to play and have some fun. This will be held at Woodside on the basketball courts. We will be starting at 9:30am, please be on time because we need to get going on time, we will finish up around 2-2:30pm. We will be playing 4 on 4 with a couple subs, stall count will be to 7, the rest of the game logistics will be explained that morning. Make sure you bring a white and a dark shirt, water, and shoes with good traction on a basketball court. This will be the last thing we do this fall so come out if you can and lets wrap up the year with a lot of fun. Thursday December 8, 2011 will be the last official practice of the season. You can also get your hoodie if you earned it by attending enough practices on this day. Congratulations to Maryland on winning the Inaugural Carrollton Clash over SUNY-Buffalo in a great game, and thank you everyone who participated in the tournament we hope you had a great weekend. You can find all the photos from the tournament at the following links. We are starting to accept bids for our spring tournament Woodside Invite, you can get further details on the Woodside Invite page. Tourney stats from this weekend's Carrollton Clash, 7 games vs college teams with a record of 2-5 and a 1 point loss in one of those games. Really great play all weekend Woodside. Schedule for this weekends Carrollton Clash college open tournament, everything should be pretty much set unless we can find someone to replace the team that dropped and get back to 18 total. Woodside folks need to be at the fields at 7:15am on Saturday to help setup and then get warmed up. First we just want to thank everyone who attended, we hope you had a great time and will consider coming back in the future. 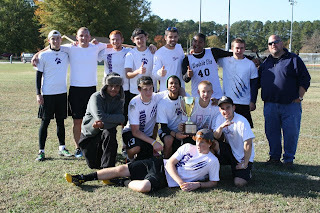 Congratulations to Towson for winning this weekends tournament, they got our awesome edible trophy courtesy of Domino's, some sweet tournament koozies to enjoy their post tournament beverage of choice in, a set of team shorts courtesy of Breakmark, and a free bid to defend their title next year. We hope all the teams had a great time this weekend, and we know they all got plenty of zone practice in. Congratulations to UMBC on winning the spirit award, we don't have an actual prize for that, but I'm sure the good karma will pay it back. Thanks to Allerdice for stepping in to fill a spot and going 2-2 vs college teams this weekend, the future of Womens Ultimate is in good hands. Congratulations to the ladies who won some prizes for being ballers all weekend and getting recognition from the other teams. Stats for Tidewater Tuneup are below. I won't be doing individual things to work on this time, I think generally speaking everyone played hard and played well. There are a couple team things I will address but otherwise everyone should focus on being at practice every day and working hard. During the scrimmaging lets focus on keeping the disc in the middle of the field and switching the field as often as we can, not forcing throws, looking to the dump early when needed. We had to make some revisions to the girls schedule, see the original post below which has been updated. About 2 weeks left if you want to apply. Below is the HS girls schedule for this coming Sunday. All games will be played on fields 6 and 7. Make sure everyone knows they should be coming out Saturday and Sunday to help with the tournament and they should be letting me know when they think they can be out there. Varsity guys are expected to come help run the tournament both days this weekend, and support the girls on Sunday like they did for you. We need several people to help setup first thing around 10am on Saturday and then throughout the day until around dark. We will need the same on Sunday starting at 7:30 until about 3pm or so. Please take a minute to let Coach Richard know when you can be there to help. First we would like to thank all the teams who attended the tournament this weekend. Conditions were tough on Saturday with strong winds but everyone toughed it out and played some great Ultimate. Sunday was much nicer with just a light breeze making for some great Ultimate in the brackets. Congratulations to Woodside Alumni for winning the tournament beating a tough Fox Chapel team in the finals. As the highest placing HS team Fox Chapel will be getting some sweet new shorts courtesy of Breakmark. The Spirit score was a tie between Bethesda Chevy-Chase and LC Bird JV with scores of 4.4 out of 5 for the weekend. Woodside Varsity needs to be out at the fields at 11 to help set up. Girls please come out and volunteer and support the teams like we asked, your help would be greatly appreciated, and the guys will be out there next weekend for you. You can show up anytime after 11. Woodside JV needs to out at the fields at 11:30 to start warming up. Don't forget daylight savings time is Saturday night dont forget to adjust your clock or you will be late on Sunday morning.